ICAN’s Pilot Executive Seminar on the ‘how to’ of Gendered and Inclusive Peace Processes Got off to a Flying Start. 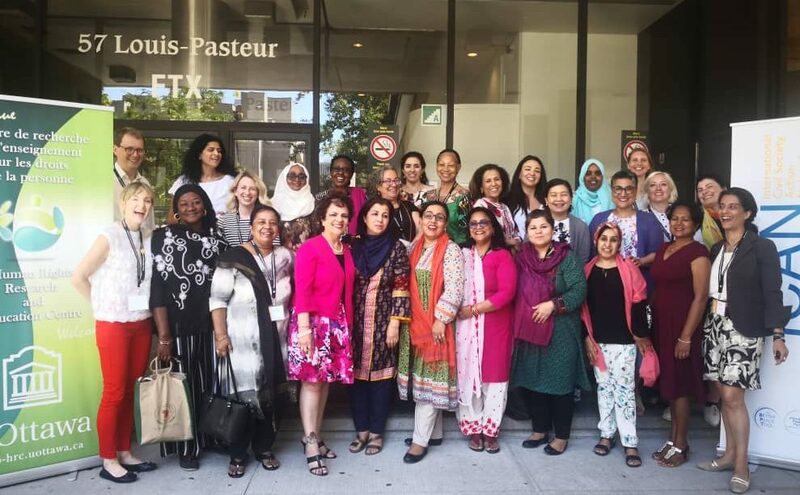 They arrived in Ottawa on July 16: twenty-five of the world’s most seasoned women peace makers and mediators from 21 of the world’s worst war affected countries. Between them, they had faced the rogue’s gallery of militias, liberation guerillas, states and extremist ideologues, from the Taliban in Afghanistan, the LTTE in Sri Lanka and the FARC in Colombia to Boko Haram in Nigeria and the governments of Syria, Pakistan, Yemen and beyond. Because they are women civil society leaders with no armies behind them, they had seen many a door shut in their face as internationally mediated, ‘track one’ peace talks were convened far from their homes, with the political and military leaders – overwhelmingly male – at the table, setting the course of the future for their families. But because these women are propelled by their resolute commitment to resolving the deep seated differences through dialogue, are armed with the courage of their convictions, and are creative by necessity, each in their own way had found a means of getting access and influence at the peace table. They came to Ottawa to attend ICAN’s Better Peace pilot executive seminar on gendered and inclusive mediation, co-hosted by the world class Human Rights Research and Education Center at the University of Ottawa, to exchange ideas and strategies, and to hone their knowledge and skills, in preparation for their relentless journey for peace at home. The event was sponsored by Global Affairs Canada, as part of the government’s feminist international development policy and was in line with the 18-year international agenda on women, peace and security. The Right Honorable Mobina Jaffer, Senator for British Colombia, Chair of the ICAN board, a champion of the Women, Peace and Security agenda in the Canadian Senate, and Canada’s former Envoy to the Sudan peace process joined the group every day. She offered invaluable insights and tactics for effective advocacy, mediation and negotiations. “Our goal through the women, peace and security agenda is to ensure these women are at the tables where the future peace is determined” said Senator Jaffer. 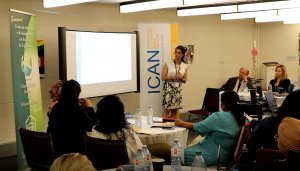 ICAN’s Founder and Executive Director, Sanam Naraghi Anderlini, and Helena Gronberg, the Better Peace Initiative Program Manager designed the program. Anderlini, who was the first Gender and Inclusivity Adviser in the UN’s Stand By Team of Mediation Experts delivered many of the sessions drawing on her experiences worldwide including strategies used to integrate women’s participation in Somalia’s peace agreements, and Nepal’s disarmament and cantonment process. 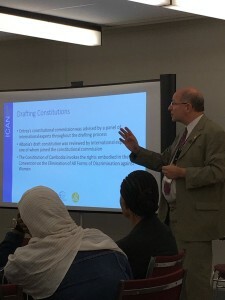 University of Ottawa Professor John Packer shared his decades of experience in addressing the rights of minorities in constitutional processes, and the transformative role of women in the Yemen National Dialogue process. Gina Torry, formerly of UN Department of Political Affairs, ran the session on gendered approaches to ceasefire negotiations, sharing her personal experiences of seeking to integrate prevention of sexual violence as part of the ceasefire provisions in the Central African Republic. The session on gendered approaches to natural resources and land rights in the context of mediation, was the first of its kind. “We also wanted to identify the best strategies for building women’s peace coalitions,” said Helena Gronberg, “to ensured they can engage, inform and influence the outcomes of peace agreements and processes.” To that end, simulations and role-playing helped participants get into the shoes and experience of militia leaders and government officials. The exchanges across the range of countries, revealed many of the differences, but also much of the similarities when power is at stake, and how women can identify and leverage their own power. WASL’s Syrian partner showcased the peace talks in Syria and pointed out that it was the women’s advisory board that managed to ensure the inclusion of other parties, namely Syrian civil society and other civilian experts to the talks. These actors, in turn, had the most impact on the peace process. Discussions of transitional Justice and reconciliation with a gender lens, complemented with ICAN’s animation tools, prompted much reflection as the different experiences of men and women were highlighted. The Libyan and Nigerian participants both pointed out how women victims are never compensated for the crimes committed against them, while the men fighters were given status and positions. “The sharing of experiences and perspectives was very enriching for people like us, who have been working in the field of mediation for twenty years, but the gender aspect was really new for many of us,” said Pakistani peacemaker Mossarat Qadeem, founder of PAIMAN Trust and WASL partner. After a week together, they emerged more unified and confident in their own abilities, as the first certified cadre of Better Peace mediators.